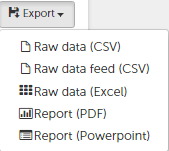 How do I export an analysis? There are two ways of doing this in the "Analysis" section of your account. Click on “Export” below the filter settings and select the desired file format. Click on the icon in the top-right corner of the respective diagram. You can choose between various different file formats.